It’s Time is a conversation between Prof. Sean Cubitt (Goldsmiths and Harvard) and Prof. Lanfranco Aceti (MIT and BU) on issues of time and its relationship to the contemporary databased and mediated narratives. The lecture will take place in the Plimpton Room, Barker Center, Room 133, Harvard University on Monday, December 4, 2017, from 6:30pm to 8:00 pm. Inspired by Italo Calvino’s Six Memos for the Next Millennium and Umberto Eco’s Six Walks in the Fictional Woods, part of the Charles Eliot Norton Lectures at the Mahindra Humanities Center, the conversation will be published by MIT Press as part of larger project that analyzes issues of time, space, movement, matter, light, and the unknown. The volume will be using a new publication platform, Contemporary Arts and Cultures (CAC), realized by Travis Rich at the MediaLab that LEA has been experimenting with. Prof. Cubitt will analyze motifs and structures that are emerging from the contemporary usage of databases as archives of times and time based narratives. These are engineered structures that simultaneously appear to liberate from and freeze in time images and their narratives. What are, then, the old media structures that can be still recognized as metaphors and “rearview mirrors” (Marshall McLuhan) in our twenty-first century data driven societies? And what is the role of time in the complexity of representation and narratives that characterize individual and social phenomena? Italo Calvino, Six Memos for the Next Millennium, trans. Patrick Creagh (Cambridge, MA: Harvard University Press, 1988), 37. 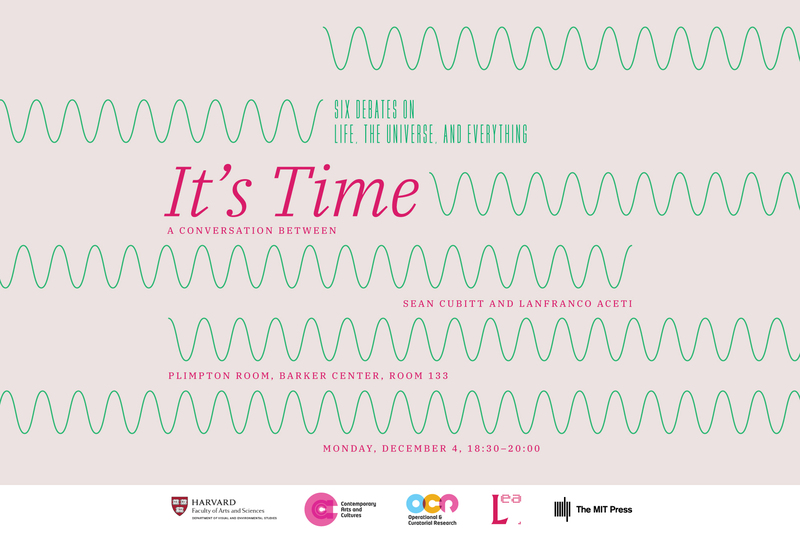 This event is graciously supported by the Department of Visual and Environmental Studies, Harvard University, Contemporary Arts and Cultures, Operational and Curatorial Research, Leonardo Electronic Almanac, and MIT Press. With thanks to the Mahindra Humanities Center.